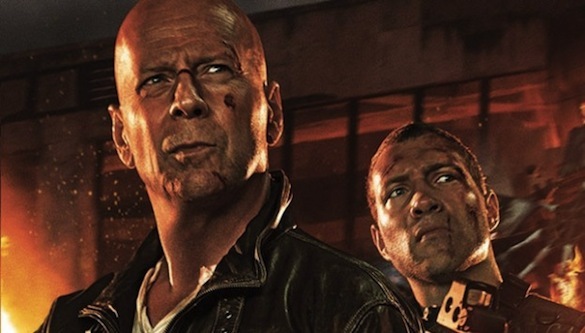 Rated M. Starring Bruce Willis, Jai Courtney. Available now on DVD & Blu-Ray. There’s not many movie franchises that reach the fifth film in the series successfully. In fact, I struggle to name one (OK – there’s Harry Potter). But for the Die Hard films, it appears five is the unlucky number. I loved the first few films in the series, packed with ironic Christmas glee and American patriotism. I struggled to get into Die Hard 4.0 other than the whole car-torpedoing-a-helicopter thing. But A Good Day to Die Hard… well, it’s just plain ridiculous. Set in Russia – taking the action out of the US is mistake numero uno – John McClane (Willis) chases down his recluse son Jack (Courtney) who appears to be in trouble but is in fact working as an undercover CIA officer. The action takes them through Russia and eventually to Chernobyl where of course, our heroes are too cool to wear protective suits. To be honest, the plot was lost on me – but then again, you don’t attend a Die Hard film for the storyline – you’re there for the stunts, explosions, and all-round escapism. This film has been criticised for its poor dialogue and I agree completely – there’s these long chats between John and Jack and you’re almost wishing a bad guy would enter the room to cease the awkwardness or blow something up. It’s a real joy that Jesus has forgiven us and so we need to be working at reconciliation and forgiveness with each other. No doubt John and Jack will continue to sort out their relationship in instalment number six which might well be called This Franchise is Overdue to Die Hard. If you like watching cars get destroyed, explosions galore, and a dollop of lens flare bigger than JJ Abrams could dish out, this is the movie for you. I’m giving A Good Day to Die Hard an extremely generous two out of five stars. Posted in 2013, Film ReviewsTagged A Good Day to Die Hard, Bruce Willis, christian, Die Hard, Die Hard 5, film review, Good Day To Die Hard, John McClane, reviewBookmark the permalink.